The Communication Center, located in Clough Undergraduate Learning Commons 447, provides undergraduate students with tutoring and coaching in written, oral, visual, electronic, and nonverbal communication. 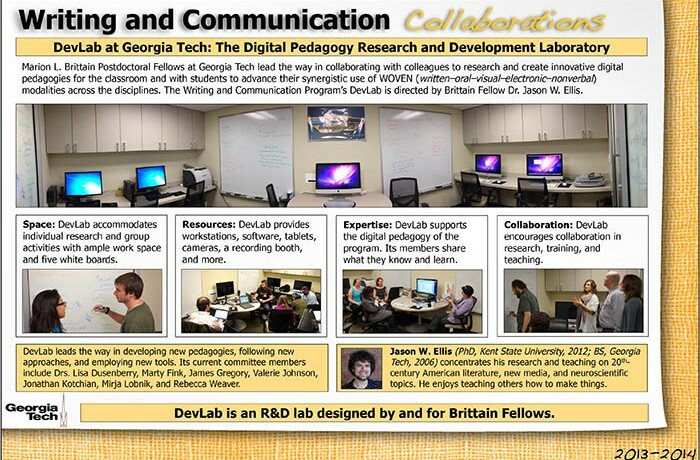 The program opened a Research and Development Laboratory (DevLab) for program faculty in 2009. This Laboratory provides computers, scanners, printers, and cinema displays for innovative digital pedagogy and the scholarship of teaching and learning. 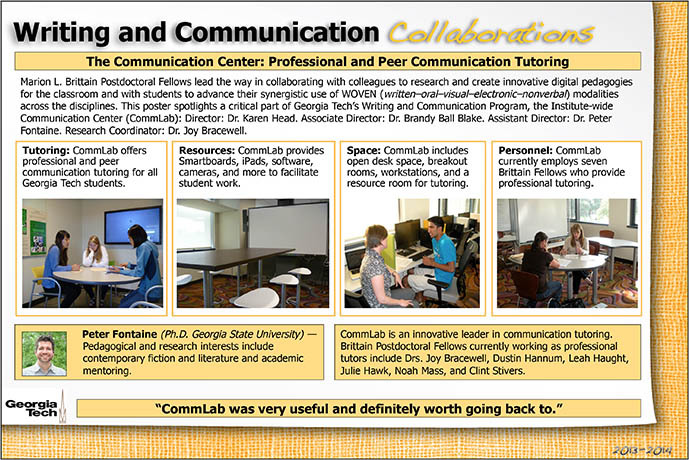 The Writing and Communication Program has its own physical facilities located in the Stephen C. Hall Building on Bobby Dodd Way, but operates across the campus, everywhere communication occurs. Please report any problems with the facility to the Assistant Director of Writing and Communication. The program’s Brittain Postdoctoral Fellows have offices on the third floor of Skiles and on the ground and first floors of the Hall Building. The Directors’s, Associate Director’s, Assistant Director’s, and Assessment Coordinator’s offices are located in Hall 111, Hall 112, Hall 113, and Hall 006, respectively. Writing and Communication Program has several unique classroom spaces to support our multimodal classes. The Hall Building has two classrooms (Hall 103 and 106) with a collapsible wall between them to facilitate linked and special courses. It also has a large meeting room perfect for screenings, roundtables, and presentations (Hall 102). Finally, Hall 005 is a small conference room for seminars, video conferences, and committee meetings. Requests to use these spaces should be directed to the Assistant Director of Writing and Communication. Faculty can also choose to teach in Skiles 302, a remodeled classroom configured especially for student laptop use, with individual mobile laptop caddies and roll-around chairs, easily adaptable for whole-class and small-group activities.